Is It OK For My Child To Use Mouthwash? Mouth rinses, or mouthwash, come in all different brands and types. There are even some that are safe for children to use on a daily basis. To determine which mouthwash is best for pediatric patients, you must understand a few things about mouthwash. First, there are generally two different kinds, cosmetic and therapeutic. As your dental professional, we suggest getting a therapeutic variety, as it will be doing far more than just masking your bad breath. When it comes to kids, therapeutic mouthwash can help prevent cavities, reduce plaque, as well as guard against gingivitis. Marked for Kids: There should be at least a couple mouthwash bottles that are specifically designed for children. You’ll likely notice a cartoon label as well as a kid-friendly flavor, like bubblegum or berry. Alcohol-Free: If it is labeled as a mouthwash for kids, it is typically going to be alcohol-free as well. This is an important rule for the product you choose. Not only can you ensure your child won’t consume a product that contains alcohol, but it will also be easier on their sensitive oral tissues, meaning it won’t cause burning on their tongue and cheek. ADA Seal of Approval: The American Dental Association (or ADA) is responsible for testing oral products for effectiveness and safety. Therefore, we always recommend that you look for products with the ADA seal of approval, for your child as well as yourself. Before you run out and buy an alcohol-free, ADA approved mouthwash for your child, you should know a couple guidelines. First, make sure you teach your child how to use the mouthwash, which includes using small quantities and always spitting the liquid out instead of swallowing. In addition, if your child is under the age of six, it is likely too young to add mouthwash to their oral care routine. 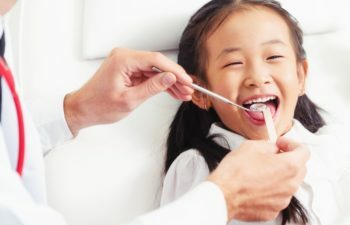 Have more questions about your child’s dental care? We want to answer them. Call Georgia Orthodontics & Children’s Dentistry today.